A prophetic voice on the intersection of faith and culture, a pioneer in ecumenical broadcasting, a leader among global Christian communicators and an innovator in media training have been named honorary life members of the World Association of Christian Communicators. Three Methodists—the Rev. William Fore, the Rev. Carlos Valle and Shirley Whipple Struchen—and a Baptist, the Rev. Ed Willingham—are being recognized by the association’s board of directors for their dedication and achievements in communications rights around the world. Installation will take place in 2010. “These four honorary life members have shown particular dedication to furthering WACC's communication initiatives and to broadening the network of people South and North working to advance social justice,” said Lavinia Mohr, an association executive. 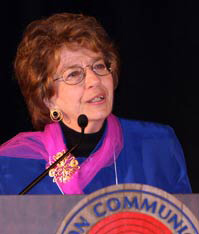 Fore, a United Methodist pastor, was the association’s president from 1982 to 1990 and served for many years as executive director of the communication commission of the U.S. National Council of Churches. The Rev. Larry Hollon, top executive of United Methodist Communications, called Fore a “prophetic voice” who advocated for equal access and justice in media. Wesley “Pat” Patillo, a senior program director at the National Council of Churches, called Fore “a towering figure in religious communications” and noted his productive career with the council. “He was instrumental in helping churches tell their stories in more compelling ways, calling them to set higher standards for their own media work, and to serve as a moral and ethical watchdog of media performance in the marketplace,” he said. Valle, a Methodist minister from Argentina, served as the association’s top executive from 1986 through 2001. He also was a staff member of the ecumenical theological school, University Institute ISEDET, in Buenos Aires, where he taught courses on communication, especially film and theology. Focusing on the world aspect of the association, he recognized the need for dialogue between communicators within North and Latin America and helped establish encounters between the two groups in 1986 and 1988. He also organized the association’s first world congress, held in Manila, and fostered a relationship with the World Council of Churches. Struchen, executive director of the Religion Communicators Council, is coordinator of the upcoming Religion Communication Congress 2010 in Chicago. Since retiring from United Methodist Communications in 2001, she has continued to work as a producer and coordinator for interfaith broadcasting projects with the National Council of Churches. She has served on the North America Executive Committee and board of directors of the World Association of Christian Communicators. Hollon said Struchen led the staff at United Methodist Communications who were offering satellite training across the church. “Shirley not only helped to develop and implement Television Awareness Training, an effort to assist concerned parents, educators and others to evaluate the effects of media upon our lives, she also helped to pioneer new ways of conducting training in a variety of subjects important to quality of life and faith,” he said. Willingham, a Baptist minister, worked for three decades with the Council of Churches of Detroit and Windsor. He was a delegate to the 1968 conference that gave birth to the World Association of Christian Communicators and was business manager of the association’s North America Broadcast Section for nearly 30 years.